The Abeka phonics program is a fantastic introduction to Abeka's teaching curriculum. You can use it as the core of a Christian homeschool preschool curriculum with very little extras needed. It is a solid homeschool curriculum that integrates phonics and high value sight words, that a young preschool age child would have difficulty "sounding out" on his own. This Christian home school curriculum focuses on teaching your child the letter sounds and begins to teach him/her to read so that he can enjoy the Bible for himself! Great Scripture passages are woven throughout this program. 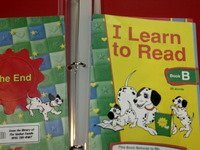 Phonics drill charts, flashcards, worksheets, workbooks, and readers comprise the curriculum for teaching the alphabet and beginning to read. That really is all that I could come up with for the weaknesses of this phonics curriculum. 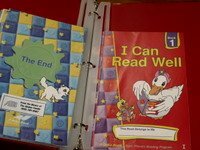 It is a very thorough program that will easily prepare your child for reading on his own. If you want your children to become confident readers, particularly at an early age, Abeka has a lot to offer. Check them out on their website to see if this is the best choice for your family.